We are delighted to announce our upcoming Champagne Evening with one of Champagne's most iconic houses, Lanson! 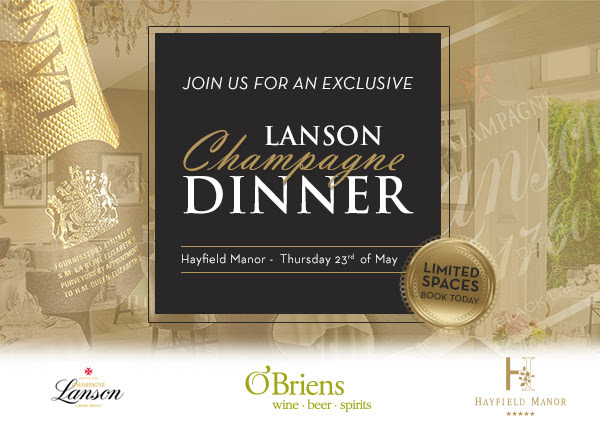 Join us on Thursday 23rd May for an exclusive Lanson Champagne Dinner in association with Hayfield Manor. A first for Ireland, we are delighted to welcome to Cork Lanson Champagne's Winemaking & Cellar Director Hervé Dantan, who will host the dinner, share his story and present his elegant Champagnes on the night. The evening will commence at 7pm with a Champagne Reception followed by dinner in Hayfield Manor's Orchids Restaurant at 8pm. The dinner will include a 3 course menu specially created by their Executive Chef, Mark Staples, to complement the different Lanson Champagnes. Price: €129 per person (available in our Douglas Shopping Centre, Cork only).